(NewsUSA) - Sponsored News - Mortgage rates have remained low, and home prices are stable or rising in most communities. The best way to learn what you need to know about buying a home is to meet with a nonprofit housing counselor. Look for a certified professional who can explain the different mortgages and interest rates, the effect of credit scores on loan approval, how much down payment is needed for purchase and how much home you can really afford. "The housing market is tough right now, with fewer homes for sale on the market than usual, and new mortgage rules and many mortgage products to choose," said Marietta Rodriguez, vice president for homeownership and lending at NeighborWorks America. "To be in the strongest position to make an offer that is accepted, consumers have to be prepared. That's where initial consultation with a housing counselor is vital, even before meeting with other professionals involved in the process." 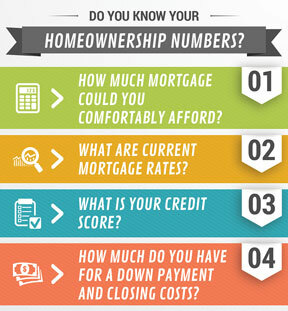 To see a video describing more about the numbers to know, click here. Smart consumers approach home ownership with a budget, but surveys show that less than one-third of potential buyers have one. Start with a budget that includes potential changes in commuting costs, home maintenance expenses and even life changes, such as becoming a parent or paying for college. "Once all the numbers are on the table, it's easier to see what type of home suits a family's budget and needs, what might be necessary financial trade-offs and what could be a direct line to trouble," said Rodriguez. 3. Be determined, not desperate. A winning bid on the wrong home can spell trouble. A bidding war could weaken your determination to find the right home while pushing the limits of your budget. Moreover, sellers know that desperate buyers may avoid inspection contingencies. "Forgoing a home inspection to move up a place in the bidding process could be costly down the road if problems and defects with the home arise. NeighborWorks recommends that homebuyers have a home inspection, and know as much as possible about the inside of a home as the outside," added Rodriguez.